Lip gloss that not only plumps but Whitens the teeth ??? Tell me there's not a Lip Gloss God, and I'll tell you to watch out for lightening (yikes !!!!) ! FusionBeauty’s newest LipFusion Micro-Injected Collagen Lip Plump Color Shines in Ripe (pictured, below) is the answer. Ripe doesn’t just plump – it also helps to reveal a brighter, whiter smile with Fusion’s proprietary Chroma-Brite™ pigment technology to deliver a chromatically-calibrated, sheer, natural wash of color that instantly offsets yellowness. What more can you ask for in a gloss??? 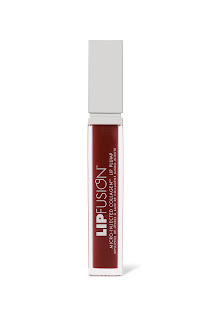 I also love the new for Fall LipFusion Micro-Injected Collagen Lip Plump Color Shines in Belle. (Pictured, below) It's a shimmery rosy brick hue that packs on the shine with loads of color for the fall days and nights ahead. LipFusion Micro-Injected Collagen Lip Plump Color Shines in Belle and Ripe ($38) will be available at Nordstrom, Sephora, Ulta, and other fine retailers beginning August 2007 ( So that means you are over a month over due on your daily dose !!!) . For more information, visit www.FusionBeauty.com. that's all I need to know to go and get some! It makes the teeth whiter??? BB-if u read the post PROPERLY-it clearly states that. I need to step my lip gloss game up. gloss and teeth whitener-who would've thought?